Branded tools at low prices. The Synergic welding DIGIMIG 200GD is used for manual welding of steel and non-ferrous metals. The device is aimed at professionals who want quality and reliability. Allows MIG / MAG, MMA (coated electrode) and Lift TIG. It can also be used to braze thin (3mm) galvanized sheets. By changing the polarization unit can be welded by MIG / MAG welding with the use of standard wire in the protective gases and the self-shielded flux cored wires. 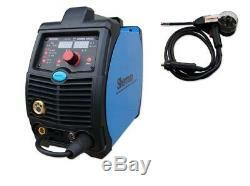 Welder allows connection of the handle Spool-type gun (SG) which is mounted at the mini wire feed reel and D100 steel wire or colored metals, so that welding can be two different wires without the need for retooling the machine. Digital control allows full control of the parameters, dynamic arc characteristics and mode welder. 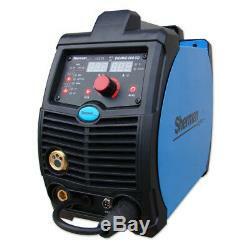 Used in the welding machine settings synergistic greatly simplify its operation and allow for use by people with less experience and hobbyists. The device has a memory of the last setting, ie after switching off and then return to the last set parameters and can store 30 sets of settings (10 for each welding method). The device is IGBT allowing a considerable reduction in the weight and dimensions of the welding device and an increase in efficiency while reducing power consumption. Welding is used in closed or covered, if directly exposed to weathering. Complete with MIG welding torch and ground cable. Supply voltage [V]: 230 AC 50Hz. Welding methods: MIG, MMA, Lift TIG, Brazing. Current consumption [A]: 35.7 (MIG) / 41.7 (MMA) / 26.8 (TIG). Power consumption [KVA]: 5.7. A spool of wire [mm]: 100, 200. Wire feed [m / min]: 2.0- 14. Dimensions (D x W x H) [mm]: 440 x 205 x 375. Functions: Arc Force, 2T / 4T, VRD, inductance adjustment, Tray 2-roll option Spool Gun, memory settings. Sherman DIGIMIG 200GD with 2 pin EU standard plug (we supply 3 pin UK adapter). Spool gun to weld aluminium. The manual is in Polish, and can provide English version on request. Deliveries to Northern Ireland, Scotland, Channel Islands, etc. Might take longer, and might charge extra costs for this. We take unprecedented measures to guarantee your things arrive securely and in place. With this option, you will receive Grey Eagle Shop's bank details when creating an order. Safely pack item(s) in a unique bundling, including documentation, manuals, guarantee data, registration, and so on. We are not in charge of lost or harmed packages. On the off chance that you are not 100% fulfilled by your item, you can return or trade your request inside 30 days from the date of receipt. Safely package things as we are not in charge of any things lost or harmed in travel. Any item not in "sellable" condition. Future Changes We are fully entitled to change these terms whenever we wish to do so, the changes will be presented on this page, the landing page, and different areas we consider proper with the goal that you know about the set of accepted rules of our administration. We save and are qualified for all rights to adjust, modify, change or overhaul these terms at any given time, so please check back from time to time. 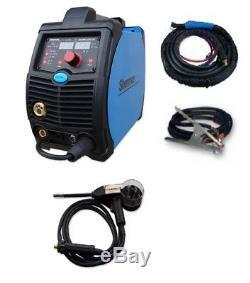 The item "Sherman SYNERGIC DIGITAL Inverter DIGIMIG 200A MMA Brazing ARC Welder+ SPOOL GUN" is in sale since Tuesday, March 13, 2018. 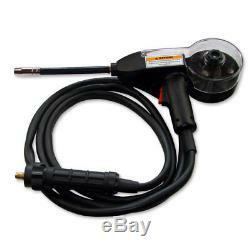 This item is in the category "Business, Office & Industrial\Metalworking/Milling/Welding\Welding & Soldering\Welding\Welders, Cutters & Torches\MIG Welders". The seller is "greyeagleshopcouk" and is located in Heanor, Derbyshire.